Dr. Howard M. Hammer is a native of Philadelphia and attended Northeast High School. He received a Bachelor of Science Degree from The George Washington University. Prior to medical school, Dr. Hammer worked in the pharmaceutical industry in clinical research. He received his medical degree from the Philadelphia College of Osteopathic Medicine in 1996 and completed his Otolaryngology, Head and Neck Surgery and facial plastic surgery training at the Philadelphia College of Osteopathic Medicine in 2002. He has practiced in Bucks County since 2002. 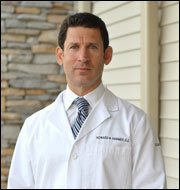 Dr. Hammer is Board Certified in Otolaryngology, Head and Neck Surgery and facial Plastic Surgery. He is a fellow of the American Academy of Otolaryngology and Head and Neck Surgery and a member of the American Osteopathic College of Ophtalmology, Otolaryngolgy and Head and Neck Surgery. He is also a member of the American Osteopathic Association, the Pennsylvania Osteopthic Medical Association and The American Academy of Otolaryngic Allergy. Dr. Hammer is a board member and President of The Ambulatory Surgery Center at St. Mary. He also serves on The Cancer Committee and Invasive Procedure Review Committee at St. Mary Medical Center. Dr. Hammer is a Clinical Assistant Professor of Otolaryngology at the Philadelphia College of Osteopathic Medicine and is a Clinical Preceptor for students from PCOM and residents from Aria Health. Dr. Hammer resides in Montgomery County with his wife and two children.